The design is slick, it’s easy to set up, and it comes with a carrying case, too. And it’s pretty easy to set up. Put a small pinch of plant food into the Hydropod and insert the plant cup. Pretty fitting for the tailgate/grilling theme I’m detecting in this box! This digital thermometer measures in Fahrenheit and Celsius and gives a reading in 10 seconds. This is one of my favorite items in the box! I love the matte grey finish and the flat sides and easy to grip finish make it comfortable to hold. This mini bean bag toss game measures 12.25″ L x 20″ W. Again, I’m appreciating the slim design, as this is something that will be nice to pull out the next time we’re entertaining outdoors, but since that doesn’t happen often, having two full-sized heavy wooden boards would take up too much space. The material is plastic and particle board covered with a wood-looking veneer, so it’s pretty lightweight, too. 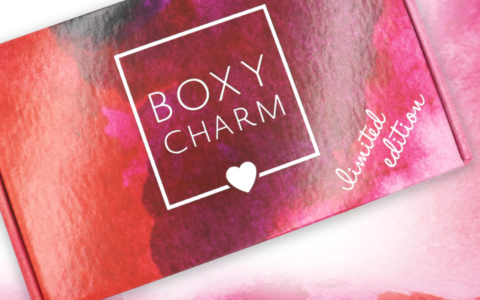 I received one of these in a POPSUGAR box and I LOVE it! This is a must-pack anytime I travel. If you aren’t familiar the lint roller sheets extend out and slide back in easily. No exposed sticky tape when you aren’t using it! And it’s great that this came with a refill, too. I’ve seen Dopp kits lined with spill-proof material before, but this is a first for me. This entire bag is silicone so it’s completely leak resistant and easy to clean. I love the matte black finish, and that the silicone material is anti-microbial. This is my new travel case! The bright red zipper pull is a nice lil’ pop of color, too! I’ve tried this before thanks to subscription boxes, and it works well. Plus this stain remover is free of peroxide, chlorine bleach and phosphates. Lastly, there’s a National Breast Cancer Foundation pin and card included with this box. Breo has donated $5 for every box sold this quarter, and you can join their campaign by donating here. I’m not a camper/a tailgater/(insert another enjoyable fall pastime here), so the grilling and outdoor game items weren’t huge hits for me, but everything else in the box was a big win. (Breo Box has a way of finding seemingly simple looking products, and once you start using them, you realize how awesome they are.) And I love that they donated to the NBCF this season, and included a pink box as well. Can you still get this box if you sign up today? Yes, the Fall box is still available! Coupon – If you haven’t signed up for Breo Box yet, use promo code MSA15 for $15 off your first box! What do you think of the Fall Breo Box? I am continually impressed by breo box. Their items always end up being some of our most-used items! We find that there are things in this box for both my husband and myself, and somehow they always include items we have been wanting! I have to disagree with whoever said this is not a “Fall” box. I definitely get the “tailgating” theme and though my husband and I are both out of college and don’t yet have children in college, my alma mater is a well known football school and we are proud to represent them and tailgate as alumni! We received this box just in time – my husband took the game to work when he had typhoon watch for 3 days over our first typhoon this week and it gave his team something fun to do and we were able to use the grill when we were without power during our 2nd typhoon this week. We haven’t had sun yet but I can’t wait to start growing my basil!! Thanks again for delivering an incredible box!! While I do not sub to this box I have swapped for an item here and there, the most recent being this little grill. Now, it is kinda flimsy BUT it is more than sturdy enough to hold your dinner up and not fall down into the coals. Clean up should be a breeze as you just need to remove the racks, lay them down to cool off and done. We camp and also thought this might be a neat idea for the two of us instead of the big monster grill we fire up. Also, even the best most expensive camp stoves have the thin metal side flaps for the flames and on those the paint burns right off as well, it is no indication of quality just how science works isnce the coals can get so darn hot. For the record, the grill weighed in at 11lbs of shipping weight and was huge so if you are swapping it stick to a geographically close area as it’s cheaper to ship. If I’m going to cook with coals in the road, then starting a fire and using a campsite provided grate and foil is much much lower maintenance….and safer. Does anyone have any details about the ‘+ perks’ portion of the ‘+perks platinum’ loyalty level? This was my 6th box, and I was charged the expected $129, but I assumed the + perks meant, well, additional perks. I didn’t get anything referencing it in my box and I haven’t gotten any emails or anything about it. Liz, do you have any info? I sent them an email yesterday asking exactly this but have not yet received a response. If I do I will post it. We will be announcing that very soon! 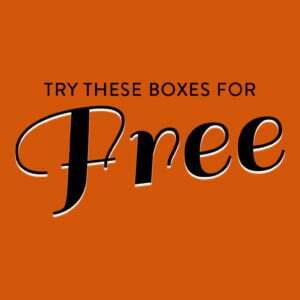 The loyalty pricing came into effect for this Fall box and perks will commence during/before our upcoming Winter box. We LOVED this box! To be fair, the grill is going to be an Xmas gift for our favorite tailgater/camper and that basil grower is perfect for our fav herb grower that doesn’t have an indoor outlet yet. That weird bags set … don’t know what to say. Only having half a game is strange. Everything else thrilled my husband. Idk but my recent experience soured me a bit. I hlhave talked them up so much in the past…yet I’m skeptical now. This stems from 2 pairs of wireless earbuds that stopped working after a few weeks of usage..a promise to replace at least one pair then …crickets. Then flat out refusal to replace. Wish I’d spent the money at Best Buy instead because I feel foolish for waising $280 for 2 boxes, for heronitems thatbturned our to be duds. Thank you and sorry for any inconvenience! Hi Chadi, I did send an email and copied you on the last response. Maybe I missed it but I don’t recall ever hearing back. Your sentiment seemed sincere, so the disappointment was steep. Not sure how to find that email, can you just send me another one letting me know it’s you and that way I can make things right? I’m with you on things not working and hearing nothing from them! My wireless waterproof speaker from the summer box stopped working after only 3 uses and I’ve tried contacting breo with no response! Then I canceled my subscription only to get a deceiving email that said in the subject line “Subscription pending “…it was just an email advertising this box and to try to get me to subscribe! I nearly had a heart attack thinking they were charging me when it shouldn’t. Again, if you indeed sent an email it was not intentional to miss it. Please just forward you request to me personally and I’ll make sure to fulfill that replacement for you. This seems like too-specific of a box. But, I love the pricing structure they have now to reward loyalty and I love that you include Amazon prices! Cancelled this sub a couple boxes ago, no FOMO over here. Unless you are a football fan who’s stadium still actually allows tailgating, this box won’t even get used for at least 6 months from now. I live in Ohio and we tailgate in the snow. I do agree that this is what it seems geared towards, in which case it’s kinda perfect. If you live in the South then Fall is about College Football and tailgating which this box is definitely geared towards. My son goes to college in the north and he’s already laid claim to most of this box. He said the game will be perfect to play in the dorm hallway in addition to outdoors. I’m not sure what he thinks he’s going to do with the grill but he said he ‘”needs” it. If it wasn’t for the hydropod I wouldn’t be getting anything out of the box for myself. The funny thing is that when I texted him a picture of everything his first reaction was “not impressed”. 10 minutes later my phone buzzed with him telling me everything he’s taking with him next time he’s home. 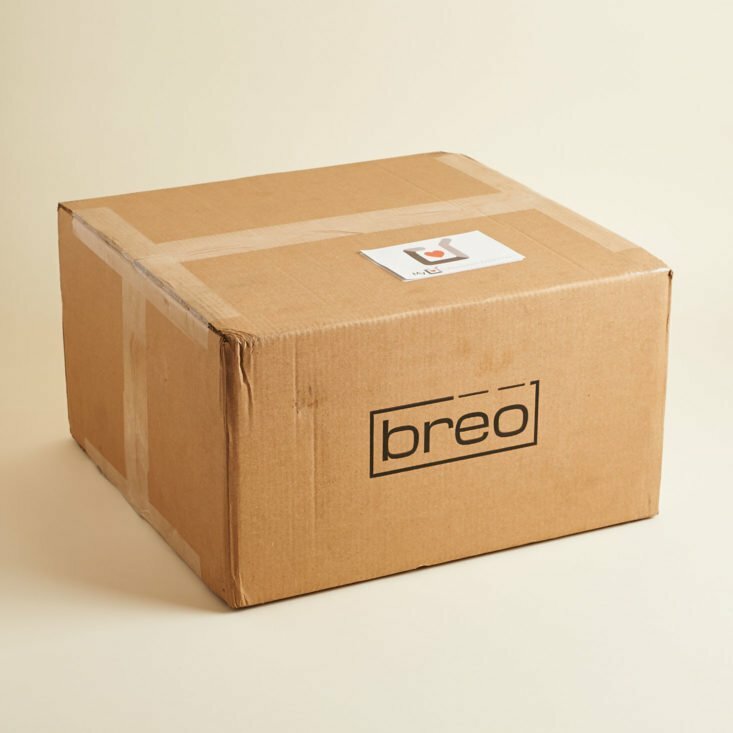 Breo is definitely our favorite family box. One of my brothers is very handy and he has taken all of the wooden boxes and created some cool things. Two of them he mounted them on his wall and put shelves inside. I’m thinking of hiding the pink box the next time he comes over so he doesn’t “steal” that one too. My son attends U of M and there are a TON of tailgaters before and after the game. This is the case elsewhere on many other college campuses. My son was thrilled with the game- which can be used indoors or outdoors so there’s nothing to complain about- and food thermometer and Dopp kit. I like the box and was excited not to have it fully spoiled. The only item that’s iffy to me is the corkcicle cup. It’s on the small side and the lid doesn’t stay on for me so using it for coffee won’t work. Otherwise I’m looking forward to the next box. Also, supporting breast cancer awareness can never be a bad thing. This was not my favorite box from BREO primarily because of the grill and the game both of which are too heavy to swap and won’t get much use from me. However, the one thing I find about BREO is though at first glance I am not impressed with the items in the box, I end up finding many of them useful. The cup really keeps my coffee hot, the dopp bag is great for my messy husband, the thermometer i was able to trade for something I really wanted and would have used if I hadn’t just bought one and the hydropod is great though I would like an aerogarden. Several other items from prior boxes are also in use at my house. Also, they have great customer service and treat their loyal customers well unlike certain other boxes. I think this was a decent box but I do wish they put out spoilers sooner so people can make the decision to sign up or cancel. While I think everything will be useful in my household, none of the items really stood out for me. In fact, none of the items stood out for me in the last box either. I really was most excited about the printer for new subscribers. Perhaps if they include popular items like that, more people would want to sign up with them. I actually agree… I looked at breo because of a summer box with the camera… I was too late for that one, I bought one and it broke (sadness) but I tried them out because of that and all of the boxes have been awesome, but nothing I would boast about sine that one. I quietly gift most of the stuff and use the rest happily… but there is a difference between being excited by a sub and being like, ok I didn’t really lose money on this. I got the winter box with the scale and watch and gave away both and the recipients loved them, but I already have two of similar scales and am a garmin girl.